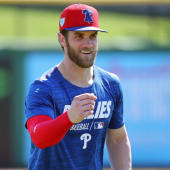 Harper will play four innings in right field in a minor-league game Monday, Scott Lauber of The Philadelphia Inquirer reports. The original plan was to restrict Harper to designated hitter duties, but he felt confident enough to test his bruised ankle with some defensive work. Assuming that goes well, he'll be back with the big-league squad Wednesday. Barring setbacks, he should be unaffected by the start of the regular season.